Kicking off a new era for neuroprosthetics, or just the warm-up? Tonight, if everything goes according to plan, a young person will stand up in front of a global audience numbering in the hundreds of millions, walk a few paces, and kick a football. This by itself may not seem remarkable, after all this is the opening ceremony of the World Cup, but for the Miguel Nicolelis and the more than 100 scientists on the Walk Again project – and the millions watching from around the world – this will mark the triumph of hope and dedication against adversity, for the young person in question is paraplegic. The exoskeleton that is being used in this demonstration is a formidable technological achievement, collecting nerve signals from non-invasive EEG electrodes placed on the scalp of the operator, and converts these into commands for the exoskeleton, while sensors on the operators feet detect when they make contact with the ground and send a signal to a vibrating device sewn into the forearm of the wearer’s shirt. This feedback, which has never been incorporated into an exoskeleton before, allows the operator to control the motion of the exoskeleton more precisely. While this is not the first EEG controlled exoskeleton to be tested by paraplegic individuals, videos released by the Walk Again suggest that it has allows for far quicker and more fluent movement than existing models. What many viewers may not know is that the use of EEG (Electroencephalography) was not part of Miguel Nicolelis’ original plan, as late as spring 2013 he was planning to use an alternative technology, implanted microelectrode grids within the cerebral cortex of the operator. Unfortunately about a year ago it became clear that the implant technology he was developing would not be ready for use in humans in time to meet the deadline of the opening ceremony of the 2014 FIFA World Cup, so the team had to fall back on the more established technique of EEG. Is this an issue? Well, to understand this you first have to know a little about the two approaches. EEG is a very mature technology. Its development dates back to 1875 when Richard Caton observed electrical impulses on the surface of the brains of rabbits and monkeys. In 1912 Vladimir Pravdich-Neminsky published the first EEG in dogs, and in 1924 the first EEG in human subjects was recorded by Hans Berger. It has the advantage that it doesn’t require surgery, but also serious disadvantages. The main disadvantage is that it records the combined signals from millions of neurons across wide areas of the cortex simultaneously, and this makes it difficult to separate out the signal from the noise. By contrast microclectrode implants record the individual signals from just a few neurons. A common analogy is that EEG records the sound made by the whole orchestra, whereas microelectrode implants record individual instruments. The result is that EEG can only be used to give relatively simple commands “move leg forward” “back” “stop” “kick” and requires a great deal of concentration by the operator. It is unlikely that the performance cam be improved upon very much. By contrast the microelectrode implants, while requiring invasive surgery, have the potential to enable much finer control over movement. In 2008 the Duke University team showed that microelectrode arrays implanted in the cortex could be used record the neuron activity that controls the actions of leg muscles (2), and that this could be used to control the movements of robotic legs. 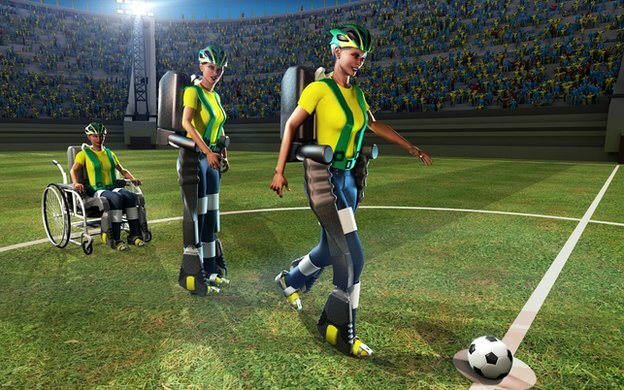 It was this that spurred Nicolelis to try to develop a mind-controlled exoskeleton that would be demonstrated at the World Cup opening ceremony. Brain Machine Interfaces – from monkeys to humans. So, if brain implant technology to control an exoskeleton wasn’t ready for 2014, when will it be ready? The answer is probably very soon, as this approach has already been demonstrated successfully in humans. In 2008 we discussed how Andy Schwartz and colleagues at the University of Pittsburgh had succeeded in developing a brain-machine interface system where microelectrode arrays implanted in the motor cortex of macaque monkeys allowed them to control the movement of a robotic arm with a degree of dexterity that surprised even the scientists conducting the study. Then in 2012 we reported that Jan Scheuermann, quadraplegic for over a decade due to a spinal degenerative disease, was able to feed herself with the help of two intracortical microelectrode arrays developed by the University of Pittsburgh team. Tonight’s demonstration will mark the culmination of an extraordinary year-long effort by scientists and patients, but it also marks the public debut of a revolution in brain machine interface technology that has been gathering pace over the past decade, largely unnoticed by the mass media. Miguel Nicolelis has come in for some heavy criticism for the cost of the Walk Again project, and for raising hopes too high, but the criticism is largely unfair. His team set themselves an extraordinarily ambitions target, and that they have fallen a little short is understandable. Once they have recovered from their exertions they will no doubt set to integrating the exoskeleton technology that they have developed with the implant technology that they are developing back in the lab at Duke University. And that technology is increasingly impressive, more advanced implant systems that allow monkeys to simultaneously control two virtual arms, microelectrode arrays that allow signals from almost 2,000 individual neurons to be recorded simultaneously (3) (in contrast the already very capable BrainGate implant system used by the University of Pittsburgh team records from less than 100 individual neurons) potentially allowing for much more subtle and delicate control, and interfaces that will allow sensory information from prosthetics to be transmitted directly into the brain. We will certainly be hearing from Miguel Nicolelis and his colleagues at Duke – and their colleagues and competitors around the world – again very soon. So tonight, as you watch the opening ceremony, remember this; for Brain Machine Interface technology as much as for the World Cup itself, this is just the warm up! p.s. And of course BMI controlled robotic exoskeletons are just one promising technology under development to help paralysed people, stem cell therapy, epidural stimulation and intraspinal microstimulation have all delivered impressive results in recent studies. 1) Wessberg J, Stambaugh CR, Kralik JD, Beck PD, Laubach M, Chapin JK, Kim J, Biggs SJ, Srinivasan MA, Nicolelis MA. “Real-time prediction of hand trajectory by ensembles of cortical neurons in primates.” Nature. 2000 Nov 16;408(6810):361-5. 2) Fitzsimmons NA, Lebedev MA, Peikon ID, Nicolelis MA. “Extracting kinematic parameters for monkey bipedal walking from cortical neuronal ensemble activity.” Front Integr Neurosci. 2009 Mar 9;3:3. doi: 10.3389/neuro.07.003.2009. eCollection 2009. 3) Schwarz DA, Lebedev MA, Hanson TL, Dimitrov DF, Lehew G, Meloy J, Rajangam S, Subramanian V, Ifft PJ, Li Z, Ramakrishnan A, Tate A, Zhuang KZ, Nicolelis MA.”Chronic, wireless recordings of large-scale brain activity in freely moving rhesus monkeys.” Nat Methods. 2014 Jun;11(6):670-6. doi: 10.1038/nmeth.2936. Posted on June 12, 2014 June 13, 2014 by EditorPosted in News, Science NewsTagged animal research, animal testing, Brain machine interface, Exoskeleton, Miguel Nicolelis, paralysis, World Cup. the animal rights lobby has the high ground, pecker head…. keep your experiments confined to volunteers and we’ll all get along fine.